of Baltic Gull from Heuglin's Gull L. (f.) heuglini (Rauste, 1999). A novel and significant	aspect of these papers was that they used moult to help support identification. Other	notable contributions to the identification of these gulls were made by Eskelin and	Pursiainen (1998) and Gruber (1999). progress made since the work published in the late 1990s. suggesting that descriptions point strongly to birds having been intermedius. Jonsson's paper was significant because it also presented new criteria for the identification of adult and immature fuscus. Effectively it marked a reset point, with previous records shelved and a requirement to identify future candidates using strict new criteria, including moult. At the present time this strictness is important because fuscus has suffered marked declines across its breeding range (Most recently this trend has been halted. Surveys in summer 2003 suggested that the Finnish population has remained stable over the last few years at around 8400 pairs (BirdLife Finland, 2004).) and so is likely to be a much less frequent visitor to the UK than perhaps it once was. 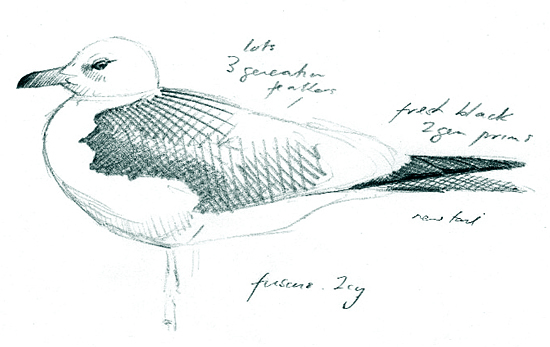 Based on Jonsson's criteria, candidate fuscus have been seen in several countries bordering the North Sea, including birds photographed in the Netherlands (site Ruud) and Cambridgeshire (Birding World 17 (5), p. 180). Most recently, a ringed fuscus (ring code CXVA) was seen at Westkapelle in the Netherlands on 16th October 2004. al., 2004). Consequently, the rather hasty CSNA decision to split fuscus has now been reversed (Sangster et al., 2003). taxonomy. It is often called Siberian Gull, although to help avoid confusion with other Siberian taxa, Buzun (2002) suggested that the name West Siberian Gull should be adopted. It is also sometimes called Tundra Gull (e.g. Luoto et al., 2002), reflecting habitat use on the breeding grounds. Traditionally it has been seen as comprising two forms: heuglini in the western part of its range and taimyrensis in the east. Genetic studies have shown that Heuglin's Gull is very closely related to the Lesser Black-backed Gull taxa (Liebers et al., 2001; Liebers and Helbig, 2002; Liebers et al., 2004). At the moment it is not entirely clear whether it should be classified as yet another subspecies of Lesser Black-backed Gull (i.e. as L.f. heuglini) or accorded species status (i.e. L. heuglini). While genetically it is more worthy of species status than fuscus, Liebers and Helbig (2002) argue that it is very much a borderline case and, for the moment, is perhaps best treated as a form of Lesser Black-backed Gull. Conversely, Yèsou (2002) suggests it should be treated as a full species. 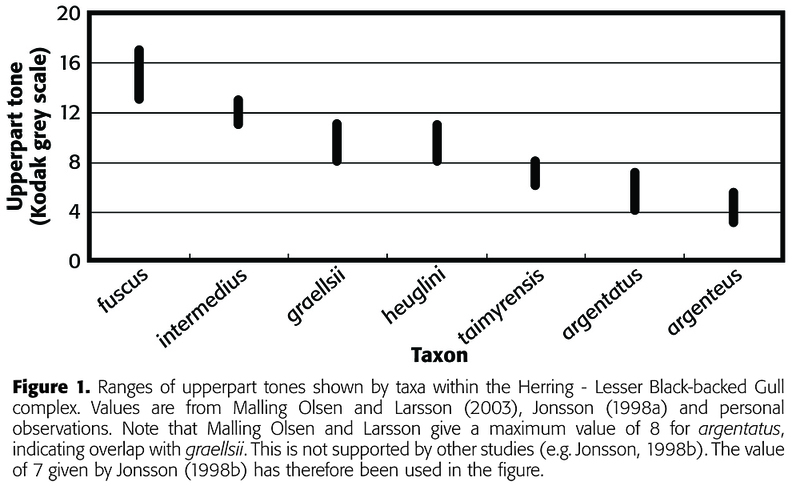 Heuglini is treated as a full species in the recent Helm gulls monograph (Malling Olsen and Larsson, 2003). therefore need a new subspecific name, for which Buzun suggested L. h. antelius. However, Yèsou (2002) put forward a number of persuasive arguments as to why taimyrensis as a form has no taxonomic validity (this is discussed in detail later). If Yèsou's arguments are correct, Buzun's re-identification and re-naming are irrelevant, as Heuglin's Gull simply comprises one form – heuglini from west of the Taimyr Peninsula. intermedius (Figure 1). The separation of heuglini from graellsii and intermedius may initially seem an irrelevant problem for birders looking at gulls in Scotland, but birds thought to be heuglini are now being recorded regularly and in good numbers in Finland, further west than it was once thought to occur. L. cachinnans, it has been overlooked in the past and actually occurs regularly in the UK. on biometrics and so is not particularly useful for field identification. Harris et al. have been published in Limicola (Rauste, 1999) and Alula (Eskelin and Pursiainen, 1998). heuglini on the wintering grounds. Heuglini adult, March 01 2008, Eilat, Israel. Picture: Amir Ben Dov. Heuglini adult, March 04 2011, Eilat, Israel. Picture: Amir Ben Dov. Heuglini adult, March 09 2010, Ashdod, Israel. Picture: Amir Ben Dov. Heuglini adult, March 12 2011, Ashdod, Israel. Picture: Amir Ben Dov. Heuglini adult, March 16 2010, Ashdod, Israel. Picture: Amir Ben Dov. Heuglini adult, March 02 2010, Ashdod, Israel. Picture: Amir Ben Dov. Heuglini adult, March 23 2012, Eilat, Israel. Picture: Amir Ben Dov. Heuglini (sub)adult, March 23 2012, Eilat, Israel. Picture: Amir Ben Dov. Heuglini, March 23 2012, Eilat, Israel. Picture: Amir Ben Dov. Heuglini adult, March 25 2011, Ashdod, Israel. Picture: Amir Ben Dov. Heuglini adult, March 26 2010, Ashdod, Israel. Picture: Amir Ben Dov. Heuglini adult, March 21 2009, Ashdod, Israel. Picture: Amir Ben Dov. Heuglini adult, March 02 2012, Ashdod, Israel. Picture: Amir Ben Dov. Heuglini adult, March 09 2011, Ashdod, Israel. Picture: Amir Ben Dov.